Though the Duwamish Tribe Longhouse in West Seattle is celebrating its 10th anniversary this month, its origins go back decades. Joleen Haas, the Longhouse’s director, observes that it “really started 30 or 40 years ago … the purpose was to have a home for the Duwamish but also a place to share our history with, and educate, everyone. We surveyed the membership and asked, what more do you want besides (federal) recognition? They said, they wanted a longhouse.” It would be the first since in more than a century, since settlers burned almost 100 Duwamish longhouses in the 1800s and early 1900s. 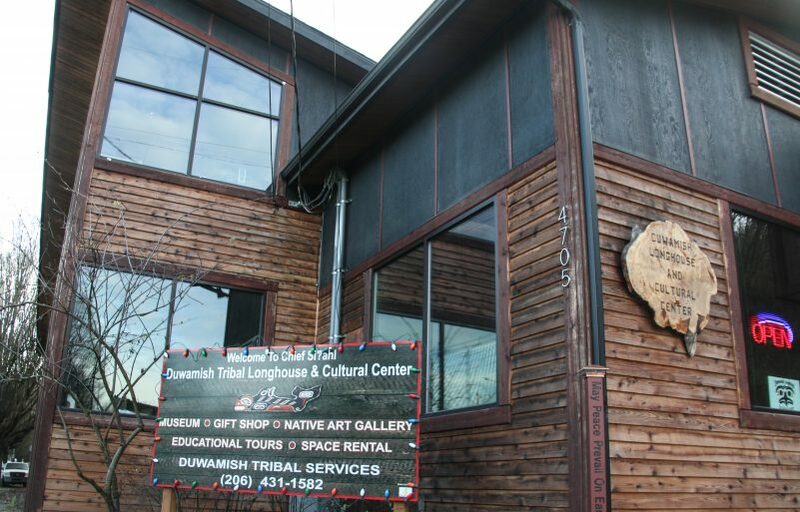 The Duwamish Longhouse and Cultural Center is located on the west side of West Marginal Way in West Seattle overlooking the Duwamish River valley near a village site where the young Chief Seattle grew up. Our Center is across the street from a major archeological site, Duwamish Site No. 1 (45-KI-23), a designated site in the National Register of Historic Places. Archeologists have uncovered a major village dated back to 600 A.D. It was occupied during the fall, winter and early spring and was known for a gathering place for shellfish from the tide flats of the original Duwamish River. Shell middens along the riverbanks are still visible: This is the only remaining stretch of the original Duwamish River. Tribal Elders in 1927 called the village Ha-AH-poos, had its own shaman (healer), several longhouses, and hundreds of inhabitants that lived there in the 1800’s. Directly north of Ha AH-poos is another major former village, Tul a’lt, or Herrings House, now Herrings House Park. This large village consisted of four medium-sized longhouses (100 ft x 50 ft) and a larger potlatch house more than 300 feet long. On Saturday, while tens of thousands of people were marching downtown out of concern over the newly inaugurated administration, the White House transition was also a topic of discussion at the Duwamish Longhouse. The day was in part a celebration of the longhouse itself – completed and dedicated eight years ago – but it began with a focus on the Duwamish Tribe‘s continued quest for its treaty rights. Our video above is from a Q/A session that followed the Longhouse’s first screening of the new documentary “Promised Land,” which is about the Duwamish and Chinook Tribes’ struggle to get the federal government to honor those rights. In our video, after lauding the filmmakers for their work, Duwamish chair Cecile Hansen answered questions (others were fielded by James Rasmussen and Ken Workman, also of the tribe). Hansen said she is “not too encouraged about the new administration, but you never know what could happen.” Rasmussen said they also are dealing with a change in who represents Seattle in the U.S. House of Representatives. U.S. Rep. Jim McDermott, who just retired, was a longtime champion of the Duwamish pursuit of federal recognition; his newly elected successor, U.S. Rep. Pramila Jayapal, hasn’t been to the Longhouse, Rasmussen noted, and they don’t know whether she is supportive or not. He also explained, when asked for details of what would be different if they had treaty rights, that Duwamish youth are not recognized as Native Americans when enrolling in college – they have been offered the chance to do so if they enroll with a recognized tribe, but, Rasmussen said, usually decline. Hansen, by the way, says she’s writing a book. She’s been fighting for the treaty rights for more than 40 years; the tribe briefly gained recognition in the final days of the Clinton Administration, saw it subsequently canceled by the Bush Administration, and then came another denial, from the Obama Administration, in summer 2015. On this Indigenous Peoples’ Day, the Duwamish Tribe remains without federal recognition. The tribe hasn’t given up the fight, and recently circulated a March 2016 document that is interpreted as giving them the right to appeal last year’s decision rejecting their longstanding bid for recognition (a challenge that Duwamish chair Cecile Hansen took directly to Interior Secretary Sally Jewell in West Seattle a few months later). The Duwamish also are getting new attention via a documentary chronicling both their campaign for recognition and that of another Washington state tribe, the Chinook. It’s called “Promised Land,” and its second Seattle-area screening is coming up one week from tonight. The trailer is above; the screening is at 8 pm Monday, October 17th, as part of the Social Justice Film Festival, at the University of Washington – details here, including how to get tickets. Closer to home, you can learn more about our area’s First People by visiting the Duwamish Longhouse and Cultural Center (4705 W. Marginal Way SW) Mondays-Saturdays, 10 am-5 pm, free admission, donations accepted. Listening to Alaska Natives is the first thing on President Obama‘s schedule when he arrives in Alaska later today. Listening to a Puget Sound Native leader is something his Interior Secretary probably didn’t expect to find herself doing in her West Seattle driveway while preparing to head north herself. 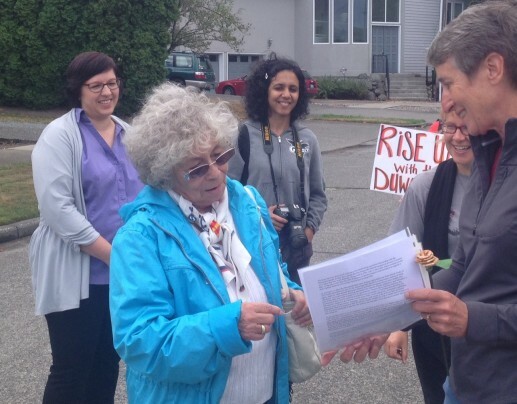 As first reported here on Saturday, Duwamish Tribe chair Cecile Hansen went to Secretary Sally Jewell‘s North Admiral neighborhood with local activists hoping to deliver a letter seeking a meeting about Jewell’s department denying the tribe federal recognition two months ago. “Ruined my Fourth of July,” Hansen said about that July 2nd decision by the Bureau of Indian Affairs. After gathering a few houses away on Saturday morning, Hansen and the group trouped up the front steps of where they thought Jewell lived (when not in DC). Though the short encounter was more cheery than confrontational, as you heard, Jewell made no commitment – referring repeatedly to the “complexity” of the recognition issue and mentioning other tribes’ “difference of opinion.” Hansen, asked afterward what she thought, pronounced what she heard to have been “political runaround.” Days after the July denial of recognition, she told media at the tribe’s West Seattle longhouse that she felt especially let down by Jewell. At the time, there also were suggestions of a grass-roots citizen lobbying effort. That might hold promise, if what happened on Jewell’s street a few minutes later is any indication. A neighbor emerged from a garage a few houses east – one still decorated for what apparently had been a luau the night before – to ask what was going on. Within a blink, Hansen and the activists were gathered outside the garage, making their case to the neighbor and several others sitting inside. Petitions were circulated. Right after that, we took our leave – the windstorm was kicking up (as you can hear in our video) and people were starting to text about tree trouble. Hansen had said her council would be meeting this week, and that a conversation was due to happen with the lawyer representing them in an ongoing court attempt to force the recognition issue. Seattle’s U.S. Rep. Jim McDermott has tried to push recognition via legislation, but it has idled. Hansen also hopes to hear from Jewell, who told her she would be back in D.C. after Labor Day, and said she at least would convey the message to Kevin Washburn, her assistant secretary for Indian Affairs, during the Alaska trip, which she noted would be followed by a visit to Eastern Washington tribes. Meantime, since the Saturday encounter, Jewell has made headlines with a gesture to Alaska Natives, announcing that Mount McKinley would be renamed Denali, the name by which it is known to them. The matter of recognizing a tribe – in, as she noted on Saturday, the face of opposition by others – is not as simple. Chair Hansen reiterated that the Duwamish are determined. Even before the short chat with Jewell, she mused that maybe if the feds remain reluctant, she could take her case to Pope Francis, who is headed to the U.S. in three weeks.